This is a picture of a new launching... well a new play boat for the Learning center in Duncan BC. Wendy’s House Dunca. Wendy Erickson knew a children’s centre named in honour of her was in the works. Erickson, who died of cancer two days after her 50th birthday in March, long had a vision for a children’s centre in the valley and worked tirelessly on building literacy skills for young children in her role as community early literacy coordinator for School District 79. The fruits of her passion are going to be realized. SD79 — in conjunction with community partners, — has been working on developing a play and discovery centre for children up to five years old and their parents or caregivers. A number of community groups have been working tirelessly to have the new learning centre ready. 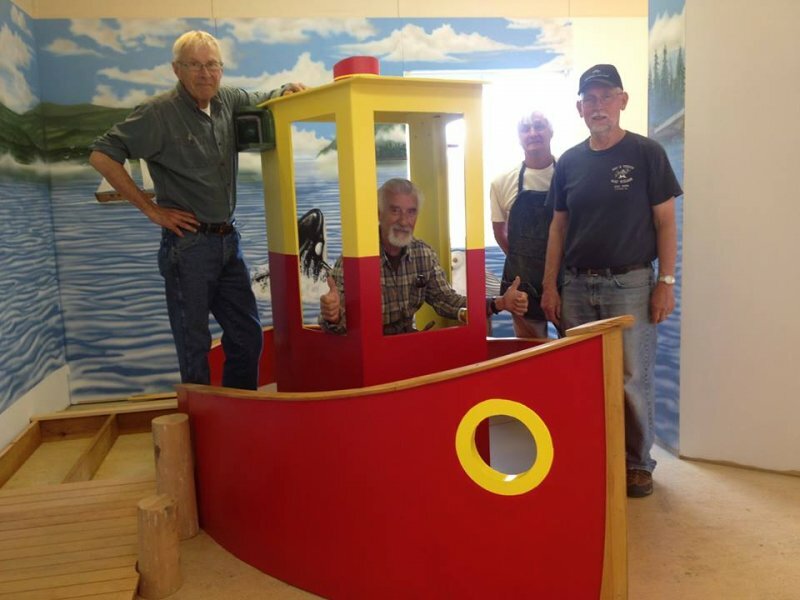 Maple Bay Yacht Club provided the funding and the Cowichan Bay Maritime Centre/ Wooden Boat Society provided the man power to create a pint sized tug boat for the children. From Left to Right. Tony Owen (Shop manager and organizer of the volunteer members), Lew Penney, Arie vanDyk (the boats designer), and Bob Weinberg from the Cowichan Wooden Boat Society/Cowichan Bay Maritime Centre.